I’ve been itching to get back into the podcast saddle after our mid-year break. And this episode is a really fun one because I got to talk about some really unique travel experiences. 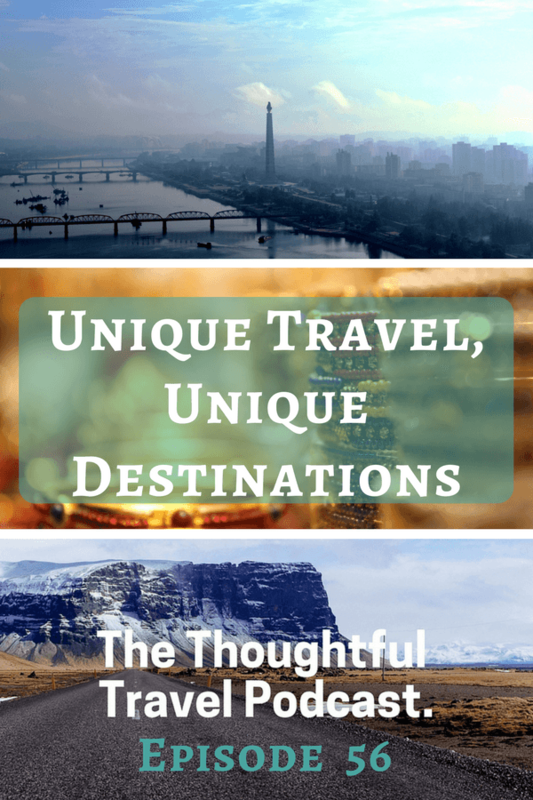 All travel is good travel, but travelling someplace that not many people get to experience, or that you know nothing about, or for a really unusual reason – well, for me, that’s the ultimate kind of travel! A love of unique travel is what took me to stay in a grass-roofed hut in Iceland, or to backpack around Tunisia, but I still have lots of other unique travel I want to do (as well as plenty of “run of the mill” travel too, don’t worry!). Hope you enjoy this episode hearing about some unique destinations and some unique reasons to travel! Travelling to unique places or travelling for unique reasons fascinates me and the three guests I speak with for Episode 56 of The Thoughtful Travel Podcast have some very unique stories to tell. Starting off with fellow travel blogger Sharon Gourlay, we chat about her recent trip to a place that I’d love to see – North Korea. Politics aside, it’s simply a truly unique experience. Next I speak with Abby Lewtas, who has travelled a lot but had a stint travelling to North America and Europe for a particularly interesting sporting reason … but you’ll have to listen to find out what sport. Finally, I heard from novelist Rachael Johns. As a writer, she gets to see some really interesting places for interesting reasons, and one of these trips took her to a small and unique outback Queensland town.